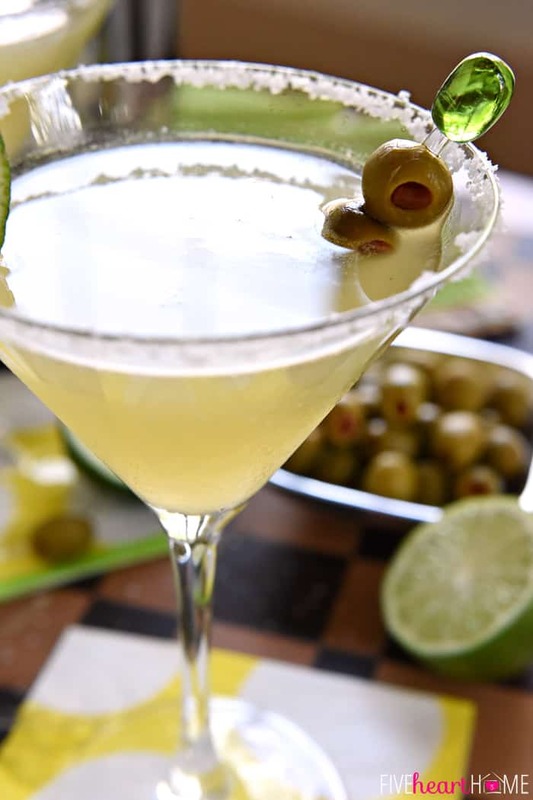 Like a margarita on the rocks with a splash of olive juice, this Mexican Martini is a copycat recipe of the famous cocktail from Trudy’s in Austin. While Mexican Martinis carry the moniker of, well, martinis, they are actually margaritas on the rocks…in disguise. 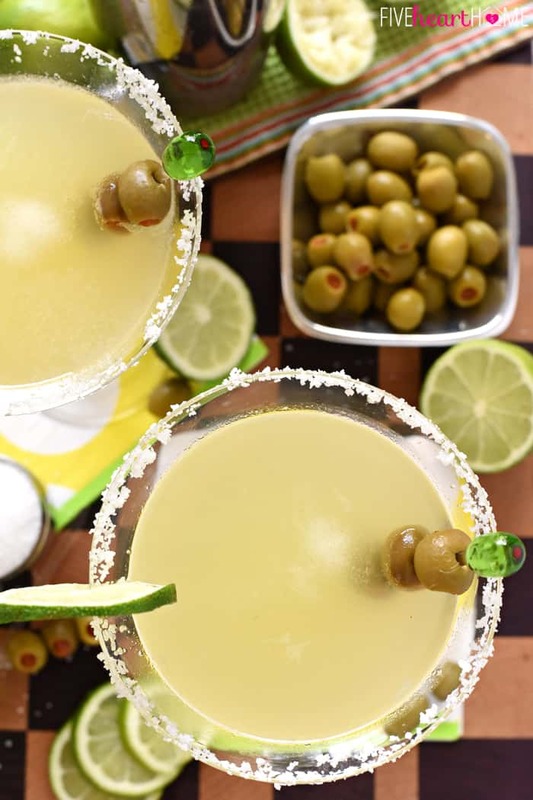 Made with your standard margarita ingredients, what sets these apart is the fact that they’re spiked with olive juice — à la dirty martini style — and shaken in a cocktail shaker before being poured into a martini glass. The result is a chilly, refreshing cocktail that’s a little bit sweet, a little bit salty, and capable of adding a whole lotta olé to your fiesta! 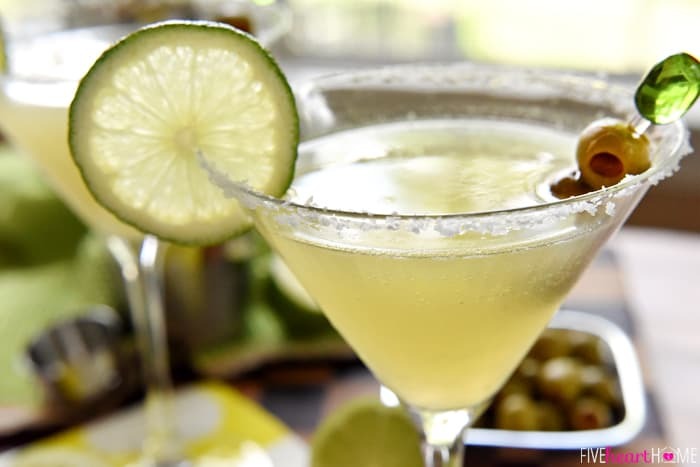 Invented here in Austin, you can find various versions of Mexican Martinis at bars and restaurants across town. But my favorite has always been the MMs at a local Mexican restaurant chain called Trudy’s. And today’s recipe, friends, is a pretty darn good copycat of those Trudy’s Mexican Martinis. So let’s break it down like a bartender, shall we? Start with a good tequila, because you’re going to be able to detect it. I prefer tequila plata (that would be “silver tequila,” for those of you not lucky enough to have had four years of Señor Rust for high school Spanish 😉 ), but gold tequila is good, too. Then comes your favorite type of orange liqueur. I keep Cointreau on hand, but Triple Sec works equally well. A true margarita connoisseur already knows that the key to an excellent margarita is using fresh-squeezed fruit juices. Lime juice is obvious, but have you ever added fresh orange juice to a margarita? It mellows out the liquor and adds a touch of citrus-y sweetness. Perfecto! Next, we’re going to cheat just a bit…shhhhh! 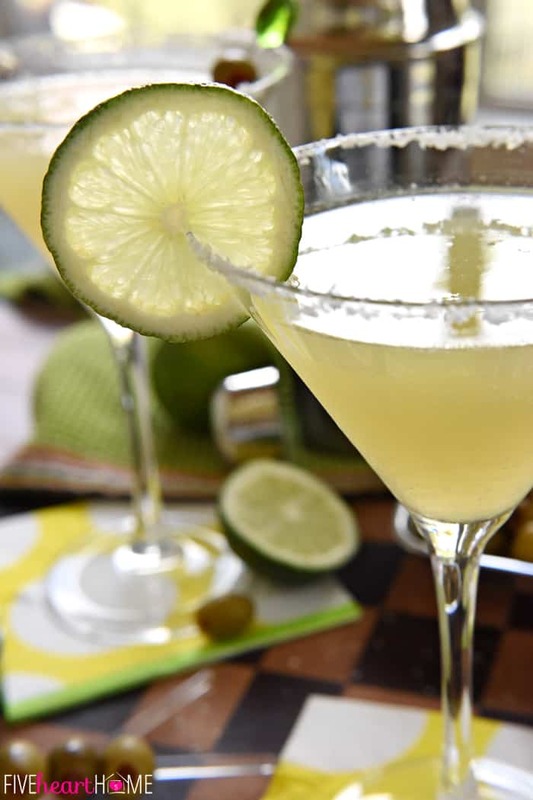 I typically use simple syrup to add sweetness to cocktails, but for these Mexican Martinis, lemon-lime soda (with its extra punch of citrus) is a nice stand-in, not to mention it’s as easy as popping open a can. 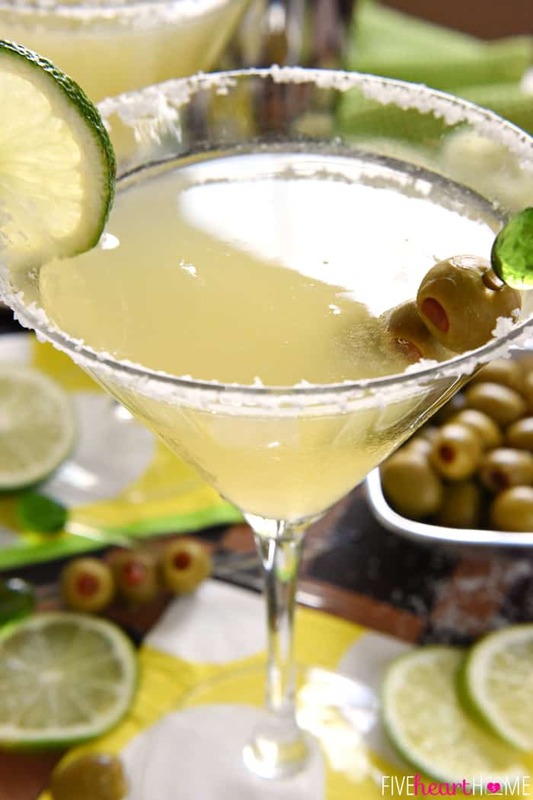 Finally, you’ll need to add a splash of the most important Mexican Martini ingredient of all…OLIVE JUICE! You are certainly welcome to get fancy and buy one of those bottles of olive juice from the liquor store, destined for dirty martinis. 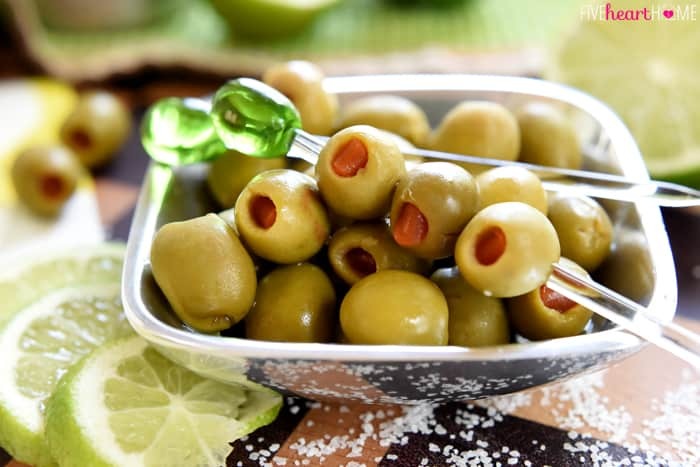 But alternatively, you can just buy a jar of green, pimiento-stuffed olives (manzanillas) and pour a bit of the liquid in which the olives are swimming into your drink. 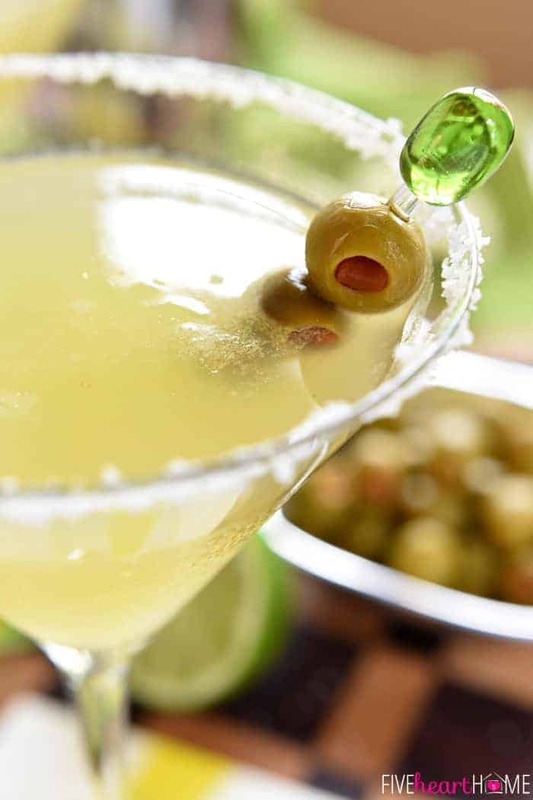 As far as how much olive juice to add, start with a splash and then add more, to taste, if you like your martinis extra-dirty. And then…shakeshakeshake your margarita concoction with plenty o’ ice in a shaker, pour it into a salt-rimmed martini glass, and garnish with a skewer of precisely three olives. Okay, okay…I guess you can use as many olives as you want. But I have found three to be the perfect number required for finishing my cocktail. One shaker actually makes enough for about two drinks, so it’s up to you if you’re going to claim it all as your own or share. As for the potency of this cocktail, please know that you are free to tweak it to your taste! I typically top mine with a bit more Sprite and a smidgeon more olive juice, but adjust any of the ingredients to your liking. Everyone has a different tolerance for how weak/strong/sweet/salty they prefer their spiked beverages, but I feel like this recipe is a pretty good baseline starting point. 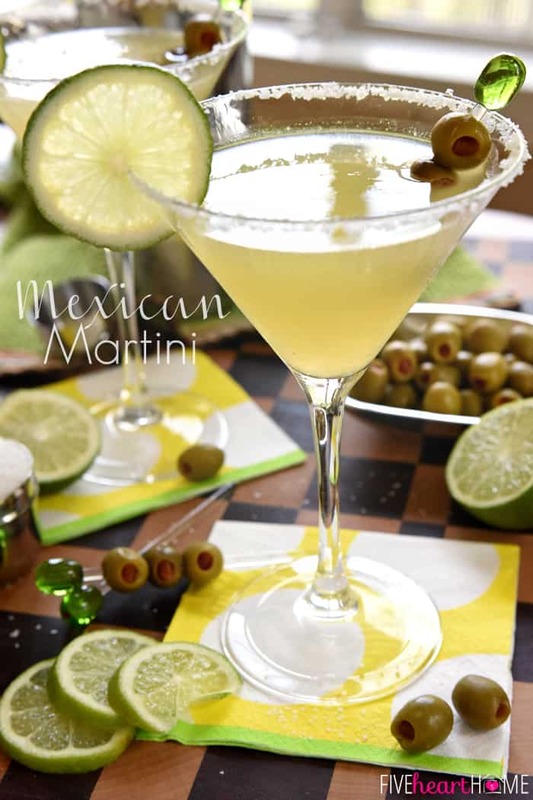 0 Response to "Mexican Martini ~ Trudy’s Copycat"